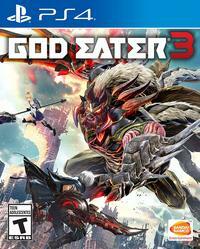 The God Eater series was always described to me as anime Monster Hunter. A few years ago that didn’t mean much, but after experiencing Monster Hunter World last year, my interest in similar games suddenly went up. Still, while there are some God Eater games on PS4, they are ports or remakes of portable games and I never quite took the plunge. 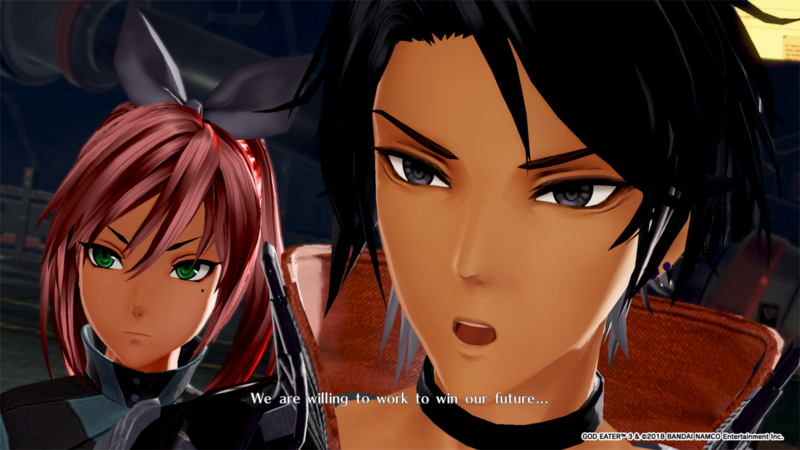 Thankfully, God Eater 3, the first one designed for home consoles, arrives to prove that the series is worth a shot even if you haven’t played the previous two games. 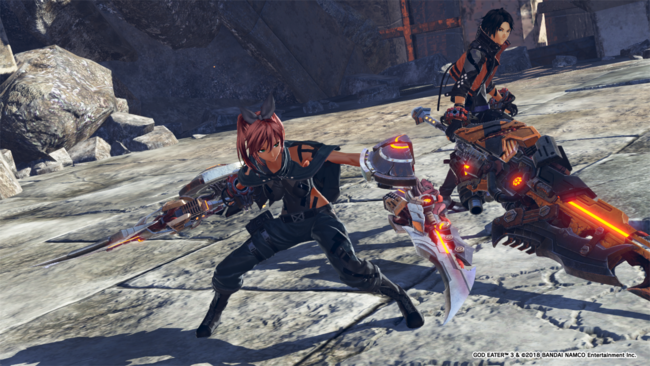 The gameplay loop of God Eater 3 is exactly what you expect: go out on a mission, kill one or more big monsters (called Aragami in this series), gather materials to upgrade your weapons and repeat. Levels are small and don’t have a lot going on. In fact, you will fight in the same handful of maps over and over again, which can be repetitive but also gives fights a quick pace. You can finish a mission in just under three minutes if you’re good enough while the longest ones shouldn’t take more than ten minutes. New to this new entry of the series are the Ash Aragami. These monsters are unique in that, just like God Eaters, they can “eat” players and enter Burst mode, giving them various buffs and new attacks while making them more aggressive. These battles are the highlights of the game, since they truly test your skills as a player in both offense and defense. As a plus, each of these Ash Aragami has their own musical battle track which makes fighting them even more exciting. While you can play these missions in online co-op, the big new multiplayer option that this game introduces are the Assault missions. 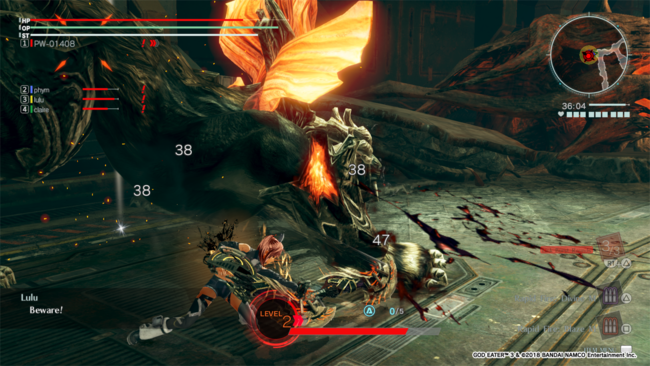 In these, you can fight alternate versions of the Ash Aragami in teams of 8 players and with a time limit of only 5 minutes. Pre-release, I could never find a full party of people, but the game filled the empty slots with NPCs. Even if you don’t complete the objective (which is very hard within the time limit) you still get rewards and can even learn new skills from other players, so it’s absolutely worth doing one of them at least once. In fact, and unlike similar games like Monster Hunter World, you can play all the missions in God Eater 3 with NPCs. Story and side missions have you playing in parties of four and the other three characters are almost always chosen by the player. Except for some story missions that lock you in with certain NPCs, you can always pick which character to take with you since they too have skills that can sometimes even boost your playstyle and their AI is very competent. It’s hard to dive deeply into all of the game’s many mechanics and how they interact with each other because the range of options it offers you can be intimidating and overwhelming at first. There’s a wide variety of systems that affect combat which can be customized and upgraded in many ways, on top of the many options you have regarding controls and UI display. However, once the initial shock wears off and you get familiar with those systems, the way they play off of each other becomes one of the key aspects of the game. While the number of weapon types is decent enough, these systems come together to give players the chance to truly find a playstyle that feels handcrafted even if they aren’t game changers on their own. And given than using certain skills a lot unlocks new yet similar ones to try out, you will constantly be getting exciting new options to tune your loadout to your liking. Still, the combat can sometimes feel a bit clunky. While the game runs fine, the animations themselves aren’t exactly great and at times can make fights a bit harder than they actually are. This stillness in the animations is also present in the cutscenes, where dramatic moments end up falling short and fights appear either too hard to follow or straight up dull. That being said, God Eater 3 is anime as hell. 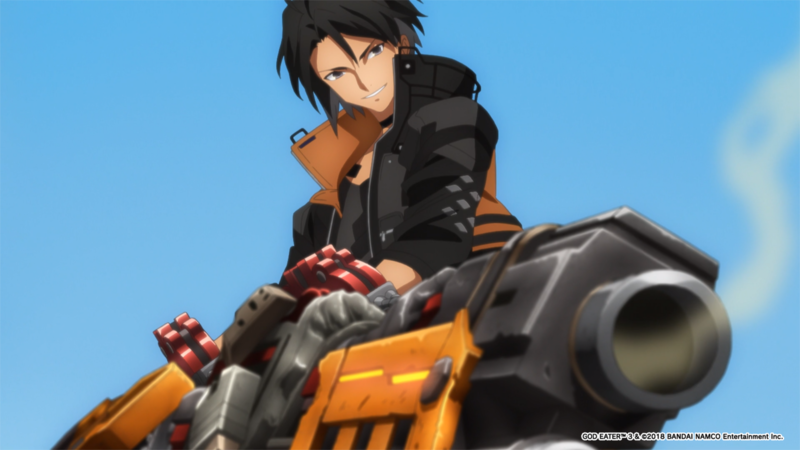 From the character designs, the killer over-the-top soundtrack, the very cool shonen-like moments, to the general atmosphere of the game, the occasional actual anime cutscene, and the unnecessarily complex jargon, God Eater 3 is peak anime whether you love it or hate it. It’s a shame that the English voice acting is just ok at best, but the game does include the option to switch to Japanese voices. The story itself seems to be just there. You play as Adaptive God Eater, capable of fighting Aragami in zones filled with an Ash that consumes every living thing. You and your crew start essentially as slaves and over the course of the game, you fight for your freedom trying to find a place in the world for you and your ever-growing family of other God Eaters. Unfortunately, the writing doesn’t have the chops to support the plot’s attempts to explore themes like loyalty, slavery, and oppression. Because of that, it finds itself in a place where it seems to suggest that both sides are bad and only really nails its epic moments. It’s a shame since none of the characters are bad; they’re just very superficial. It’s easy to care about them but mostly because of how much time they’re on screen and not because of whatever character development the game attempts to have. The whole plot could’ve been much more, but it never gets there.